Super R-Type is to retro gamers what super root canals are to dentistry patients: it’s not just painful, it’s super painful. Unlike root canals, it can also be super addicting. All of the rage against all that is retro, that the games are too hard on purpose, designed to prevent players from completing them to extend their shelf life post-purchase, falls not on deaf ears but on fertile soil. Or at least it will after you play this game for yourself. However, the fact of the matter is, like it or not, that the R-Type series has been ground zero for brutal difficulty since its first outing. Developer Irem initially published R-Type for the arcades, which pitted the space pilot against all manner of slimey and slithery xenoforms. The shmup was both lauded by the critics and drenched in the tears of gamers who lost their lunch money to its bullying design. It was no less potent a game when it came home to the Master System, ZX Spectrum, and PC. 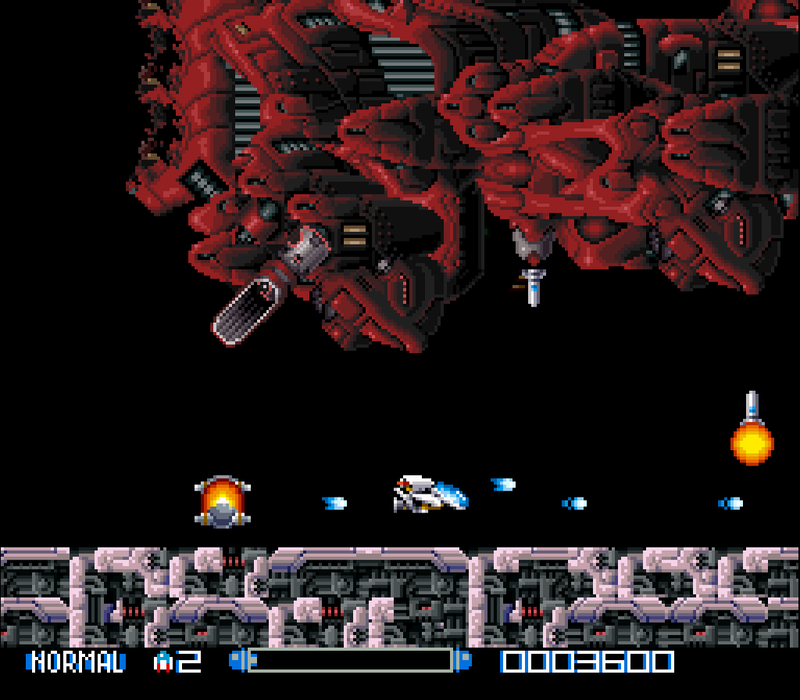 Irem followed up the original with R-Type II and Armed Police Unit Gallop. R-Type as a series was beginning to become influential for the future development of shoot ’em up games, what with its charging shot, its array of orbital weaponry, and its massive malevolent monsters. September, 1991. Super R-Type hit the shelves just a few short days after the launch of the Super Nintendo in North America. It wouldn’t necessarily come to define that golden age console, not for many fans of it that I have met, but it was I recall a game that made its presence known. I encountered it frequently but never had the skill or wit to defeat it. At one point, I even owned it, though whence it came or went, I couldn’t say. Super R-Type was like R-Type 2.5; it was a half-port of R-Type II, taking bits and pieces of its predecessor and stitching them together in new mangled, Frankensteinian genius. Super R-Type grave-robbed four of the stages from R-Type II and then added in three of its own. 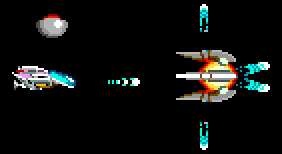 In addition to the Force and Bits (these are defined in the Gameplay section below), the game introduces a few new weapons and lasers of all kinds, turning your R-9Custom (the title of your ship) into a highly agile, pyrotechnic, death machine. Just watch all that firepower, which you’ve carefully collected while facing off against swarms of enemy ships, minefields, alien worms, armadas, and bosses the size of half the screen, vanish into thin air upon taking a single hit, forcing you to restart the entire level over again! Somewhere, an Irem employee is laughing at you. In the immediate context of the fairly new 16-bit era and the first year of the Super Nintendo, Super R-Type stands out as bigger, brighter, more colorful and articulate, and more visual complex. Not every stage features a black background of shifting stars and planets. Some of the later levels, such as the labyrinth where sections of walls move to block your passage, feature some well-crafted layers and parallax scrolling. The boss sprites are of course going to be most impressive. The huge mech that occupies an entire room at the end of level 2 is just one example. Amid pixel art achievements like these, it’s easy to overlook the subtler touches, such as the R-9C sprite banking as it turns upward and downward. For a clearer comparison, take Gradius III, a launch title for the SNES, ported from the 1989 arcade version. Side by side, Super R-Type has a bigger sense of scale, broader use of its color palette, more intricate backgrounds and enemy models. It makes Gradius III look archaic for merely coming out two years earlier and being a home console port. There’s an opening cutscene in Super R-Type that shows the player’s ship being prepped for flight before launch, and it’s surprisingly well done, considering the diminutive attendants represented with just a few pixels beside the craft. The biggest downward effect upon the visuals in Super R-Type, though, is its infamous slow-down. The game reeks of it. Some levels have so many moving pieces, it overloaded the system and the action drags down to the zombaic shamble. On the one hand, this slow-down is extremely useful for dodging bullets and hazards. On the other hand, the unpredictable rate of speed can create its own dangers, and in no way can it sensibly be said that the visual slow-down makes for a coherent or smooth gameplay experience. Now we’re onto the Force and juicy Bits! So this is an iconic element of the R-Type games, the satellite ships that you can obtain which will attach or orbit around the R-9C. The Bits are far less complicated and you can have either one or two. They sit at the top and bottom of your craft and can lend you some much-needed width to your firepower. There’s also the R-9C’s ability to charge up its main wave cannon. A bar displays at the bottom of the screen to demonstrate how charged the cannon is. I found it a little confusing, though, as the kind of projectile that would fire from it seemed to be unpredictable. A big horizontal blast can be unleashed or a huge fan of energy can be fired. The latter is the one that’s most useful, I think. Getting up close to the weak point of a boss and tearing lose a huge discharge of energy can sometimes even lead to the boss going down with that single hit! No way around it: this game is hard. Even on easy mode, it can still be very difficult since your craft can only take a single hit. My kingdom for a force field! Zero checkpoints mean you’ll be getting intimately familiar with each level as you’ll likely die on the boss fights, even after reaching them a few times. A single misstep can result in loss of life. After completing the game on easy, you’ll be taken back to stage 1 in normal mode, and beating the game through a second time will revert things to hard mode. No idea what that’s like and I don’t want to find out. Super R-Type isn’t unfair but it will put your shmup skills to the test. It demands you play it with perfect precision. In the modern age of bullet hell titles, what are you afraid of? This game isn’t hard to learn. Space shooters have been around since the dawn of gaming and even with all the bells and whistles represented by the power-ups in Super R-Type, a bit of experimentation will likely satisfy inquisitive minds and the simple control scheme should come almost naturally. Because of the multiple difficulty modes, taking you back to the first stage after completing the game, and because of the amount of challenge present, I think Super R-Type has an above average amount of replay value for those accustomed to or interested in space-flight shoot ’em ups. Play it with any investment at all and you’ll be replaying a lot of its stages over and over, so if that isn’t replayability then I don’t know what is. Player frustration with the difficulty may vary. Space shooters weren’t anything new by the time Super R-Type rolled around, and standing against it is the fact that it’s a semi-port borrowing elements from R-Type II. Sure, the particulars of the R-Type series style of gameplay focusing on interesting power-ups and peripheral satellites are present here, but Super R-Type didn’t pioneer them. If anything, this game is most noted for its difficulty. I recently completed this game for the #RGBhighscore event being hosted on Twitter by @Retrogamebrews and what a blast it was to play in a high score competition. I can’t say it’s anything I’ve ever done before in gaming. While my showing wasn’t nearly as good as it was with my jam, Zombies Ate My Neighbors, I was glad to have fun with Super R-Type and have some motivation to play through what would otherwise be a bit of self-flagellation. Yes, this game is tough but that’s part of its appeal. That appeal didn’t ultimately make it land on my favorites list, but it’s an okay game by me. Super R-Type gets a lot of crap for the slowdown, and while yes, it is an issue I think a lot of the game’s content is really cool. Frustratingly difficult yes, As is the case with the rest of the series dying once is essentially game over because you lose all of your power ups. Be that as it may, I think it’s a standout for the nice visuals (ahead of many launch Super NES games), and fun combat. It’s also a fairly common game making it a great game to pick up for those getting into the Super NES. R-Type III is far superior, as are other games like UN Squadron, or Phalanx. But those games are getting pricey. Average doesn’t have to be a bad thing people! Great review! Agreed on all points! Thanks! I’d put Super R-Type even well above average. The slowdown actually helps, regardless of the technical standpoint of it all. The difficulty provides its own motivation and fun factor. The visuals look great for that early age.